No, spring is not here. It is 8 degrees out as I write this. I am just fiddling around here, tapping my fingers on the table, metaphorically speaking, until I can get outside. This photo was taken yesterday, indoors of course. 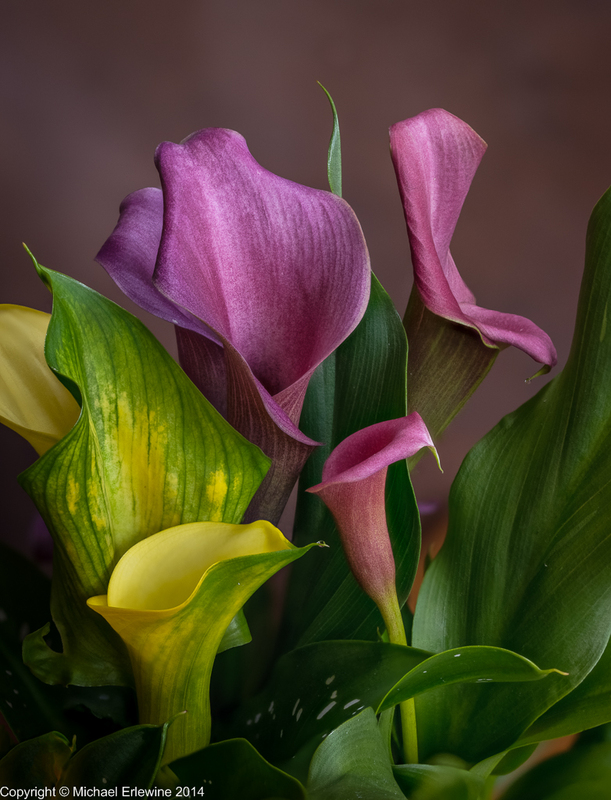 It is hard to find Calla Lilies these days that are any good. This is a nice bunch, but the colors may be too wild for some of you. I love photographing flowers and the Cyclamen and Calla Lilies are always endlessly interesting. The goal here is to get the group in focus so that the two very small drops of nectar on the tips of two of them (and the tips of all) are sharp and clear. Did pretty well on that. Using a Nikon D800E camera and the Zeiss Otus 55mm f/1.4 APO lens with a tiny extension.